It has been a long while since I've put up a Sunday Salon post, but I have some miscellany I'd like to share with you all, and this is the perfect venue for it! I recently started watching POV (Point of View) on PBS. It's a series of independent documentary films. It's really, really good! Has everyone been watching this series and not telling me about it?! I have seen two episodes so far - one about a very conservative Muslim woman in Syria who is working to educate and empower girls through the Qu'ran, and one about Navajo high school students who want to go to college and get off the reservation but struggle to do so because of a whole host of difficulties. They were both very, very interesting to watch, and I highly recommend tuning into the series if you live in the US. Up Heartbreak Hill will make your eyes water, probably, but the GOOD kind of eye-watering. It's so, so good. I never knew a teenage guy with a massive pink mohawk could be so eloquent. With all the garbage that comes to us through the airwaves, it's important that we remember those people who bring us quality programming and expand our understanding of the world. This series is very powerful - watch it! The Doomsday Book, by Connie Willis - SO excited to have found this one on the shelf! I have had plans to read this one with Marg for quite a while, so I'm glad to now have it on my shelf so that I'm ready for it. The Summer Book, by Tove Jansson - I really enjoyed The True Deceiver, so I'm excited to read a book that's so different in tone by the same author. A Gathering of Old Men, by Ernest Gaines - A more recent addition to my wish list about a murder in the Deep South in the 1970s. Very excited to read it as it comes highly, highly recommended by Jill. This will probably be the first one I pick up of the seven here. Blood & Thunder: The Epic Story of Kit Carson and the Conquest of the American West, by Hampton Sides - I read Lions of the West with Kari recently and we both wanted to delve more deeply into frontier history, so here we go! Two Old Women, by Velma Willis - A folk tale about two old Alaskan women who are forced to fend for themselves in the wilderness. Sounds like a fun, quick read, and one I'm glad to have found as I try to read more diversely. Jamaica Inn, by Daphne du Maurier - EVERYONE IN BLOGOSPHERE loves du Maurier and I've never read her! I found an uh-mazing vintage edition of this novel and had to pick it up. Elyza, by Clare Darcy - I like this author's light-hearted Regency romances, even if they aren't always exactly historically accurate. This one gets high ratings, but I've never found it in a library, so I'm excited to have grabbed this one! As for what I'm reading at the moment, I am sloughing my way through a few books. That isn't really fair to say, though, as I'm very interested in all of them. I am very annoyed by my inability to download and listen to most audiobooks through the library now as my laptop has completely crashed and my iTunes refuses to let me download audiobooks books without wiping out my entire current library. (How is this possible?!) Therefore, I am forced to only download books directly to my phone via the OverDrive app, and the app only lets you download MP3 files, not the .WMA files that most books appear to be. ALSO, the app does not let you listen at 2X speed, so I constantly feel like I am listening to such a slow story when I could be all the way done by now. Clearly, I need to learn patience. I am currently listening to The Warrior's Apprentice by Lois McMaster Bujold on audiobook, the first in her science fiction Vorkosigan series (well, technically the second, but the first that features Miles as the protagonist). It's very good, but the OverDrive app is really annoying in where it starts and stops so I often find that I've been listening to the same part twice and only realize it maybe 5-10 minutes after I've started (this says a lot about my attention span). So that is upsetting. But the book is very good! I'm also STILL reading A Suitable Boy, by Vikram Seth. Only about 370 pages to go now, though! Woohoo :-) I try to ignore the fact that 370 pages is the length of a good-sized novel, and be proud of the fact that I am 75% of the way done! I am absolutely committed to finishing the book, but I don't think I will try any more Vikram Seth for at least a few years. I enjoy his writing style and his characters and the plot, but WHY DOES IT TAKE 1500 PAGES TO TELL A STORY? I feel this is unreasonable. Also, 1500 pages of very small font, so it's really like, 1800 pages. I keep reading and reading and reading and never feel that I am making much progress. I also feel like, 1121 pages into a book, you should be more than 75% of the way through. BUT I AM NOT. Sigh. I also started Nothing to Envy this week, about people who have escaped from North Korea. It came highly recommended in the comments of my review of Pyongyang, and I'm so glad you all told me about it! I'm really liking the narrative style, and I'm glad I was able to pull it into my reading queue so quickly after reading De Lisle's book. Demick has a much more sympathetic tone than De Lisle did. And that's all for me! What are you reading this week? I used to watch POV pretty regularly, but my PBS station couldn't seem to settle on a consistent time for it, and I fell out of the habit. I did love a lot of what I saw, although the quality varies, since it's different filmmakers each week. And what great finds at the book sale! 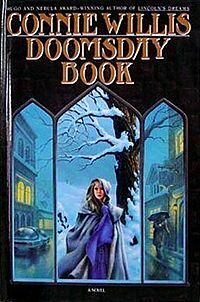 I have Doomsday Book out from the library now and hope to read it in the next month, but we'll see. And good luck with Jamaica Inn. I haven't read that one, and from what I can tell, it divided du Maurier fans, but I know lots of people love it. It may be the next one of hers that I read. Oh, I could see POV being inconsistent. But I don't think I'll mind so much because it features such varied topics! I think the next one is on the "death of darkness" or something, about how we live in a world that is always lit. I am excited to hear what you think of Doomsday Book! I don't think it will be nearly as light-hearted and fun as To Say Nothing of the Dog, but it's been on my wish list way longer, so hopefully it's mah-velous. Oh, Oh, Doomsday Book is one of my favorite books EVER of ALL TIME! Can't wait for you to read it!!! I'm very excited to read it, too - It will be epic!! Book sales are so hard to resist. I have a pretty giant TBR and still can't walk on by. Hope you're enjoying your reads. I have three on the go at the moment, including a huge compendium of Hans Christian Andersen's fairy tales. It's a really old translation, which is throwing me slightly. Yes, I could see that. Though in some ways, fairy tales SHOULD be read in archaic language, so hopefully it at least adds to the atmosphere! I am ready to read Doomsday Book when you are! I will find it on my shelves! I really need to get back to the Vorkosigan series. I really enjoyed the ones I have read! I have Jamaica Inn here to read at some point too. Awesome - let's definitely do Doomsday Book before the end of the year. I have a buddy read with Jill after I finish A Suitable Boy, and then I am good to go! Okay! Just let me know when you are ready! I will! I'm very excited now - maybe we can read it sooner rather than later! I don't think you need cable to watch PBS, do you? I think it should be available with your regular programming. I have the same problem with the Vorkosigan series. The only other ones on audiobook are much later in the series. So I will have to switch to reading them in paperback until then, I think. I love your edition of Jamaica Inn! Du Maurier is one of my favourite authors, so I hope you enjoy it. And the problem you're having with the Vikram Seth book is the same problem I'm having with Clarissa by Samuel Richardson - it's 1500 pages too and I feel like I've been reading it forever without making any progress. Yes, and Clarissa is also written in old fashioned language, which probably makes it even harder! I think I tried to read it before, but it didn't go well. I've never seen POV...I'll have to check it out. Love DuMaurier...and bought Rebecca and Jamaica Inn a few months ago for a reread. Enjoy! Yes, POV is definitely worth looking for! I'm sorry, what? Do people listen to audiobooks at 2x speed? Can you do that? It doesn't sound all squeaky like a chipmunk? I never heard of such a thing before. Nothing like a book sale! I loved Doomsday Book - hope you and Marg will too. It seems universally loved - I'm very excited about it. I second all the effusive comments about Doomsday Book - it's awesome! Wow, I haven't seen so many positive comments about a book in a long time! I am ashamed to admit that I skipped most of the political parts in A Suitable Boy after about the halfway mark, because it was all just too much for me, and I got really lost. I did finish the book,and liked it, though that was many years ago. I am SO THRILLED that you got a copy of Doomsday Book as well! It's one of my favorites, and I hope you love it! Such universal acclaim for The Doomsday Book - I can't wait! WHAT MORE IS THERE to say that a sequel is warranted? It takes place in the 2000s, allegedly with Lata's grandson. I hope you enjoy Jamaica Inn, but I will add that Rebecca is my absolute favorite of her books. You should check that one out at some point too! Is that the cover of your edition? That is awesome. I am impressed you are reading A Suitable Boy, I think I can skip that one in my life. But, it will feel like a huge accomplishment! I'd like to think I could love a 1500 page book, but I'd need to hear like...universal acclaim for it!